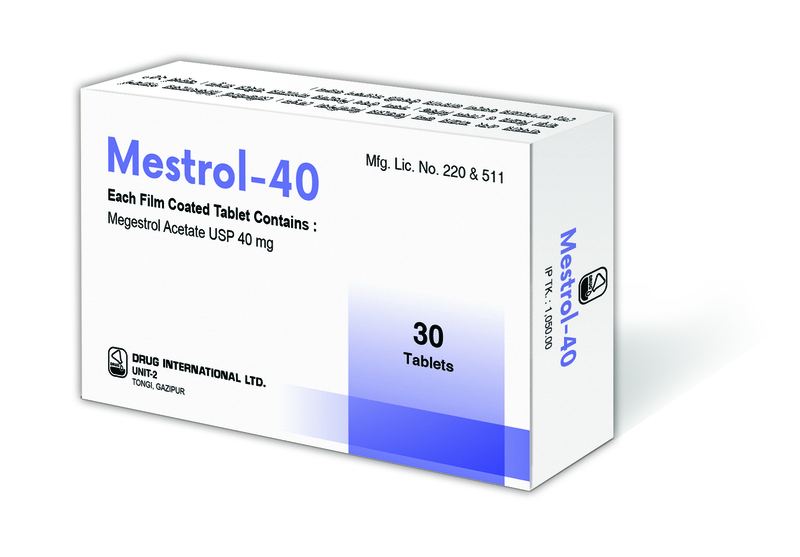 COMPOSITION: Mestrol- 40: Each film coated tablet contains Megestrol Acetate USP 40mg. Mestrol-160: Each film coated tablet contains Megestrol Acetate USP 160mg. INDICATIONS: Megestrol Acetate is indicated for the palliative treatment of advanced carcinoma of the breast or endometrium (i.e., recurrent, inoperable, or metastatic disease). It should not be used in lieu of currently accepted procedures such as surgery, radiation, or chemotherapy. It is also indicated for the treatment of anorexia, cachexia, or weight loss secondary to metastatic cancer. Breast Cancer: 160mg/day (160mg taken once daily). Endometrial Carcinoma: 40 to 320mg/day in divided doses (40-80mg one to four times daily or one to two 160mg tablets daily). At least 2 months of continuous treatment is considered an adequate period for determining the efficacy of Megestrol Acetate. Use in Pregnancy: Pregnancy Category D. There are no adequate and well-controlled studies in pregnant women. If this drug is used during pregnancy, or if the patient becomes pregnant while taking this drug, the patient should be apprised of the potential hazard to the fetus. Women of childbearing potential should be advised to avoid becoming pregnant. Use in Lactation: Because many drugs are excreted in human breast milk and because of the potential for adverse reactions in nursing infants, nursing should be discontinued when receiving Megestrol Acetate therapy. Packing: Mestrol-40: Each box contains 30 tablets in Alu-Alu blister pack. Mestrol-160: Each box contains 30 tablets in Alu-Alu blister pack.